Great article that came at a good time. Thanks! Good post, well explained. I’ll bear this in mind for future articles. Thanks for this article idea and template. In my experience, using ideas and templates like this is one of the best ways to write more great articles in less time. We would all do well to keep this in mind when we are writing our articles. I just used this template and posted three articles. Yeah! I’m loving it. Okay – now on to the real work – I have to post my ezine. Never heard this before but articles are new to me so may give it a try. Chris – I agree when you use the word ‘principles’ it can make it sound as if these are the ONLY principles. To avoid sounding too exclusive a friend of mine uses the word ‘Touch Points’. It leaves the topic open for more to be said. For example, ‘6 touch points for leaders’ is more realistic than ‘The 6 principles of leadership’. Though, depending on your target audience you may want a stronger verbage. When writing, you use your senses, why not initiate some originality in this process as well? Wouldn’t that constitute the Sweet Smell of Success? Remember I live in feedlot country – we KNOW the delicate aroma of a successful summer! Or the 5 misspellings of Success even? Chris: Great advice. It reminds me of the old basic “principle” of delivering a speech: Tell ’em what you are going to tell ’em; tell ’em and then tell ’em what you told ’em. I think your advice will work well for blogs as well, since brevity is key to blog posts. Keep the good stuff coming. I’ve published a lot of articles with you and most of the time haven’t used the “Principles of X.” But looking at this list gives me new inspiration for writing, especially since I’ve had writer’s block for awhile now. Thanks! Thanks a lot! It will be easy to write usefull articles. Great article. It’s always nice to have fresh ideas to work from. Thanks for posting. Again, having a picture is worth a thousand words! I am learning a lot from these tutorials. I have made it a point to read one per day. English is my second language, and although the same principles apply in Spanish, to read it in English, somehow it gives me more confidence in my writing. I hope to find one article that will explain when and how to use heading 1, heading 2, heading 3 and so on. 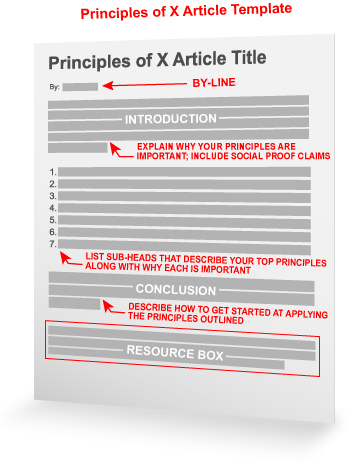 After reading this principles of X article template, i’m extremely excited to write some high quality contents and draw the attention to my audiences. I got right opportunity to learned some creative and excellent ideas to write nice article. Thanks alot. Most excellent guidelines. Start here folks, and craft that article. Do it now, use this template. You’ll be surprised how easily it comes together!